Ping Fu knows what it's like to be a child soldier, a factory worker, and a political prisoner. To be beaten and raped for the crime of being born into a well-educated family. To be deported with barely enough money for a plane ticket to a bewildering new land. To start all over, without family or friends, as a maid, waitress, and student. Ping Fu also knows what it's like to be a pioneering software programmer, an innovator, a CEO, and "Inc." magazine's Entrepreneur of the Year. To be a friend and mentor to some of the best-known names in technology. To build some of the coolest new products in the world. To give speeches that inspire huge crowds. To meet and advise the president of the United States. Born on the eve of China's Cultural Revolution, Ping was separated from her family at the age of eight. She grew up fighting hunger and humiliation and shielding her younger sister from the teenagers in Mao's Red Guard. At twenty-five, she found her way to the United States; her only resources were $80 in traveler's checks and three phrases of English: thank you, hello, and help. Yet Ping persevered, and the hard-won lessons of her childhood guided her to success in her new homeland. Aided by her well-honed survival instincts, a few good friends, and the kindness of strangers, she grew into someone she never thought she d be a strong, independent, entrepreneurial leader. A love of problem solving led her to computer science, and Ping became part of the team that created NCSA Mosaic, which became Netscape, the Web browser that forever changed how we access information. She then started a company, Geomagic, that has literally reshaped the world, from personalizing prosthetic limbs to repairing NASA spaceships. 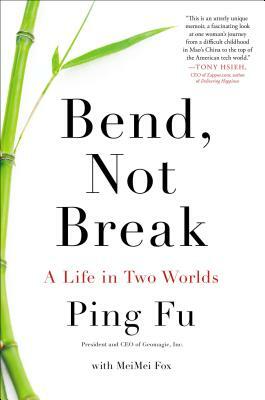 "Bend, Not Break "depicts a journey from imprisonment to freedom, and from the dogmatic anticapitalism of Mao's China to the high-stakes, take-no-prisoners world of technology start-ups in the United States. It is a tribute to one woman's courage in the face of cruelty and a valuable lesson on the enduring power of resilience. Ping Fu is the founder and CEO of Geomagic, a 3D digital reality solution company. She earned an M.S. in computer science at the University of Illinois and worked at the National Center for Supercomputing Applications and AT&T Bell Labs. She is a member of President Obama s National Council on Innovation and Entrepreneurship and a board member of Long Now Foundation. She lives in Chapel Hill, North Carolina. MeiMei Fox is an author and book editor who also blogs regularly for the Huffington Post."